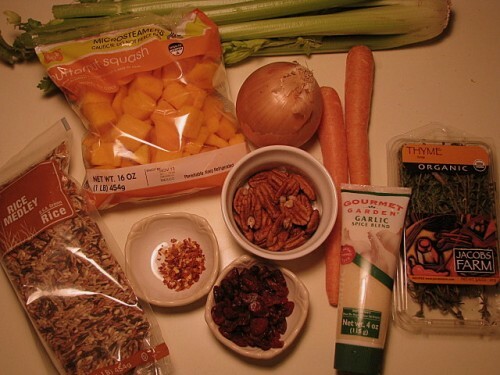 A vegan inspired “stuffing” for Thanksgiving (or anytime of the year). It’s been awhile since I’ve talked about mindful eating, sharing recipes, and pretending I can cook. Oh ya, pretending I can take food pictures, too. And if you are vegan – you’ll be happy to know this recipe is 100% vegan. This is my test recipe for an upcoming family gathering. You see, when our families get together for the holidays, my aunties opt me in to, “bring a green salad”. Granted, I make awesome mixed green salads – filled with cranberries, sunflower seeds, tomatoes, sprouts, purple onions, seasonings, the list goes on. But who wants to always bring the salad? That’s like being the designated soda person. I wanted this year to be different. 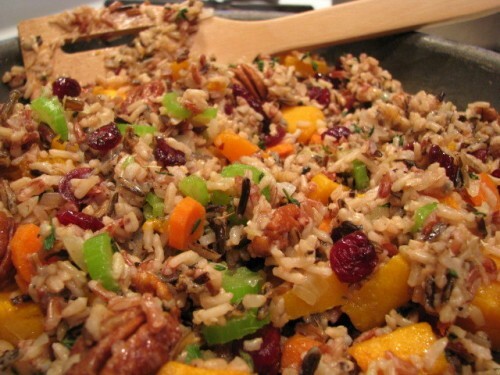 Flipping through my cookbooks and paging the web, I found this delicious Autumn inspired vegan dish, Wild Rice with Butternut Squash, Cranberry, and Pecan ‘stuffing’. It reminds me of a stuffing. In fact, if you want to be ultra creative, you could stuff this wild rice mixture into halved acorn squashes and roast them for 25 mins or so at 400 degrees. It would make for a pretty plate. Ya! totally bad lighting. Where’s the daylight when you need it? With a French accent, repeat, “Mise en place” or Putting in Place. It means to prepare your ingredients before you start cooking. Measure, wash, chop, cut, and place ingredients in individual bowls. I love this step before cooking. Like pulling off the fresh Thyme leaves by pinching the stem with your fingers and railing up so the leaves fall off. Or chopping the celery in thin slices. It my mini-therapeutic Zen session. Weird, I know. Wish I had a better pic of the Thyme and red pepper flakes together. It reminded me of Christmas with the red and green. Holidays on the mind. Steps 2 and 3 take similarly the same amount of time to complete. Prepare these steps at the same time. Roasting the squash gives the dish a delectable taste due to the it caramelizing. Alternatively, you could steam the squash for 15 minutes or boil it in water for 10 minutes. Cook the Wild Rice. One cup of wild rice, add 2 – 2½ cups of water and a dash of oil. Bring to a boil. Then turn heat down to medium-low and cook until water has been absorbed. About 40-45min. After the rice and squash are cooked. Heat a wide skillet on medium-low. Gently toast chopped until aromatic. Watch carefully that they do not burn. About 1 min. Transfer nuts to board and reserve. Turn heat up to medium-high, add oil, and sauté the onions and garlic until translucent and soft. Add celery, carrot, and red pepper flake and stir-fry for a three minutes. 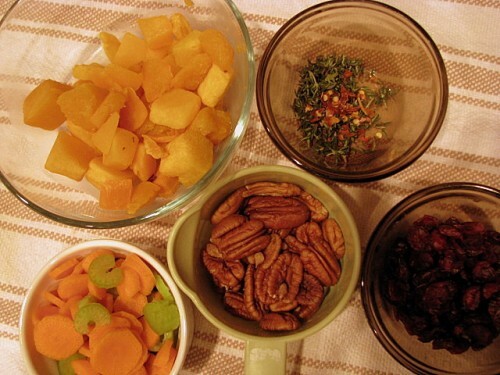 Then add cooked rice, squash, thyme, cranberries and pecans. Add salt and pepper to chef’s taste, toss to combine. Pair with a green salad. Enjoy! Oh ya, I said to pair it with a green salad. Well, looks like I’m bringing the salad, too! The dish? It is rather tasty. I almost forgot to add the salt and pepper. Geesh on me. But enhanced the flavor of the dish right at the end. It’s a good tasting dish. And I look forward to the flavors developing even more overnight. This entry was posted in Family & Relationships and tagged butternut squash, vegan thanksgiving, wild rice on 2010-08-08 by Christine.